Sets the color table to pPal. The contents or pPal are copied. Applies a filter to the bitmap. Slow but simple function to set a single pixel. 32 bpp only. Slow but simple function to get a single pixel. 32 bpp only. Returns memory used by a bitmap. Returns number of bytes used per line. Unlocks the Bitmap surface. (See Lock for specifics.). Returns whether a bitmap surface is locked. (See Lock for specifics.). Sets the bitmap resolution in pixels per inch. Delete memory allocated by member variables. Initialize internal table of line addresses. Can be called from internalCreate() to initialize object state. Device- and OS-independent bitmap class. Manipulates uncompressed bitmaps of all color depths. This class is an abstract base class. It exists to define a format-independent interface for bitmap manipulation and to provide common routines. Derived classes must support at least the color depths 1, 8 and 32 bpp. 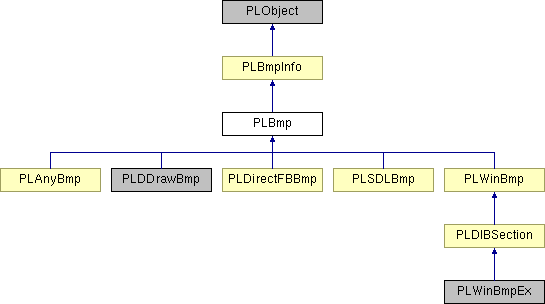 PLBmp defines a public interface for general use and a protected interface for use by derived classes. For 32 bpp, alpha channel information is stored in one byte (PL_RGBA_ALPHA) of each 4-byte pixel. To allow for optimizations when no alpha channel is present, a flag is set whenever the alpha information is valid. The complete alpha channel of a bitmap can be replaced by a different one by calling SetAlphaChannel(). A 0 in an alpha channel entry is completely transparent; a 255 is completely opaque. Definition at line 39 of file plbitmap.h. Empty constructor. Constructors in derived classes create a small empty bitmap to ensure that the object is always in a sane state. Returns true if Bmp and this are almost equal. The comparison is done by comparing the pixels in the bitmaps component-wise. If all components are closer than epsilon, the bitmaps are considered almost equal. Creates a new empty bitmap. Info contains the metadata (width, height, etc.) to be used in creation. Creates a new empty bitmap. Memory for the bits is allocated but not initialized. Previous contents of the bitmap object are discarded. If bAlphaChannel is true, the bitmap is assumed to contain a valid alpha channel. Creates a copy of rSrPLBmp, converting color depth if nessesary. Supports 1, 8, 24 and 32 BPP. Alpha channel information is preserved. Creates a copy of rSrPLBmp, applying rFilter on the way. Depending on the filter called, this is often much faster than CreateCopy() followed by ApplyFilter(). Find the nearest color to cr in the palette used by this bitmap Only works for 8 bpp bitmaps. Returns pointer to an array containing the starting addresses of the bitmap lines. This array should be used whenever the bitmap bits need to be manipulated directly. Definition at line 375 of file plbitmap.h. Referenced by PLFilterFillRect< PixelC >::ApplyInPlace(), and GetPixel(). Definition at line 390 of file plbitmap.h. Definition at line 382 of file plbitmap.h. Returns number of colors that can be stored by a bitmap with this this color depth. Definition at line 361 of file plbitmap.h. Returns the address of the color table of the bitmap or NULL if no color table exists. The color table is stored as an array of consecutive PLPixel32 objects. Definition at line 398 of file plbitmap.h. Creates a new PLBmp as copy of rSrPLBmp. Assumes there is no memory allocated yet. Implemented in PLAnyBmp, PLDirectFBBmp, and PLSDLBmp. Locks bitmap. Currently, this is only usedby PLDDrawBmp - other derived classes always behave as if the bitmap were locked. GetLineArray() and other direct-access methods should only be called if the bitmap is locked. Lock and Unlock keep a lock count. In most cases (currently: all but PLDDrawBmp), the lock count will always be >= 1. Assignment operator. Note that assignment between different derived classes is possible and results in a format conversion. Reimplemented in PLAnyBmp, PLDirectFBBmp, PLSDLBmp, PLDIBSection, and PLWinBmp. Definition at line 314 of file plbitmap.h. Referenced by PLWinBmp::operator=(), PLSDLBmp::operator=(), PLDirectFBBmp::operator=(), PLDIBSection::operator=(), and PLAnyBmp::operator=(). Test for equality. This function actually tests every pixel, so it's not fast. It's meant mainly for use in asserts and such. Replaces the alpha channel of the bitmap with a new one. This only works for bitmaps with 32 bpp. pAlphaBmp must point to an 8 bpp bitmap with the same dimensions as the object. The alpha channel information is physically copied into the bitmap. Fills the color table with a grayscale palette. This function is only useable for bitmaps containing a color table. Index 0 contains black (0) and the last index contains white (255). The alpha channel is set to opaque (255) for every palette entry. Sets whether a bitmap stores an alpha channel. Works for 8 and 32 bpp bitmaps. In either case, if b is true and the bitmap did not have an alpha channel before the call, the complete alpha channel is set to opaque by the call. Sets one entry in the color table. The function may only be called if there is a color table stored with the bitmap. The color table entry is set to the red, green, blue, and alpha values specified. Definition at line 334 of file plbitmap.h. Definition at line 323 of file plbitmap.h. Sets quality of conversion to 8 bpp by CreateCopy(). Valid parameters are defined in FilterQuantize.h.